We came here through the narrowest of lanes. They spread like a lattice on the north bank of the Waveney, and you leave the busy Bungay road near the former Anglo-catholic shrine church of Shipmeadow in Suffolk, and suddenly you are lost to sight. It is like entering Norfolk through the back door. The area reminded me of bandit country, the borderlands between the Republic of Ireland and the British North in the 1980s, as if only the main roads would have customs posts, and these back lanes were left to farmers, smugglers and terrorists. Obviously, I was rather less concerned about what we might meet around the next corner, unless it was a tractor, and we would need to reverse all the way back into Suffolk. St Mary appears rather prim from the north, but you come around to the south side and the church expands, as if relaxing. There is a big, blockish south aisle, and a curious stair turret to the tower, presumably added in the 19th Century. 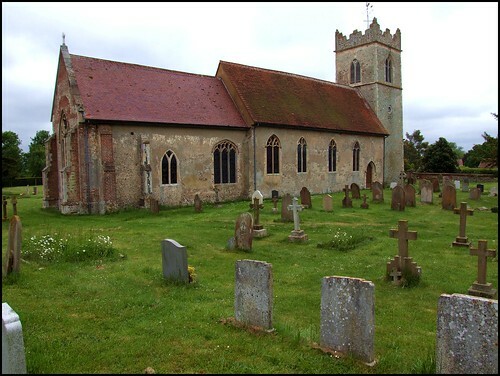 This church is not terribly well-known, unlike the church of St James in the distant parish of Great Ellingham off in the west of the county. This is partly because the church is kept locked. There is a keyholder, a very nice man, but he lived so far off and in such a convoluted route that in the end he gave up trying to give me directions and brought the key to the church instead. St Mary is a long, handsome church inside, obviously well-kept and well-used, and the white walls and light box pews give it an air of light and space. This is fortunate, because it offsets an excellent range of stained glass from the late 19th and early 20th centuries. Best of all are the windows on the north side of the nave. They get more recent as you head westwards. 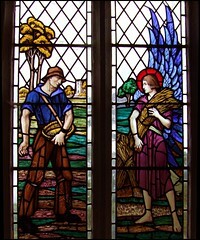 A wonderful Annunciation scene is accompanied by a harvest window depicting an angel, and another of Christ the Good Shepherd, two subjects which must have had a real resonance in such a remote, rural parish. They are the work of Reginald Bell. The sower stands with Ellingham church behind him. At Colne Engaine in the lanes of north Essex you can see exactly the same window, but with Colne Engaine church in it! More curious, the older window remembering a vicar's wife, Amelia Harriet Smith, shows her as Mary at Bethany sitting at the feet of Christ, and then as one of the mothers allowing their children to come unto Christ. There is a good Kempe window of the Adoration of the Magi, and a Ward & Hughes scene of the story of Naomi and Ruth. There's something very odd about the arrangement of the nave and aisle. At one time there were two aisles, or possibly a north aisle predating the south aisle, because in the north wall there are remains of the arcade. This must have been very early, probably 13th century, because on the central remnant there is a bishop's head and upside-down dragon in the style of the period. Even odder is the south arcade. It extends the full length of the church, and the two most easterly bays in the nave were rebuilt to match that in the chancel. Curiously, the stone that remembers this on the south side of the arcade has a misplaced apostrophe, something we tend to think of as a modern disease. Even odder, the older part of the arcade is simply cut in the wall. Is it possible that at one time a solid wall separated the western part of the nave from its aisle? At first sight, there are two World War One rolls of honour hanging on the south arcade. In fact, one of them is for the workers of W. D. & A. E. Walker Ltd. Jonathan Neville's Norfolk Mills site tells us that they ran the wherry boats which carried goods up and down the Waveney, and also owned the mill and maltings we had passed to get to the church. They were obviously the largest local employer. Shortly after the First World War, the navigation rights and boats were sold to the brewer Watney, Combe, Reid & Co, while after the Second World War the mill was bought by Hovis. All are done with today: the mill closed in 1967, and boats no longer bring food up and down the river. Instead, articulated lorries thunder through the night up and down the dual carriageways cut across old East Anglia. Sic transit gloria mundi.